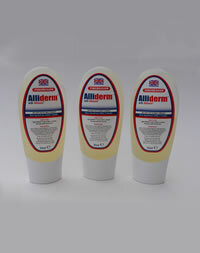 Allimed® Spray comes with a convenient spray head for directing a fine mist of stabilised allicin liquid wherever it is needed. Use as often as required. Designed for use by Health Professionals. Ingredients: Water and allicin liquid. Advisory Information: If you are allergic, intolerant, or hypersensitive to garlic do not use Allimed® Spray. Brilliant product for easing my dogs otitis externa. This gives him really sore ears and constant scratching with only veterinary treatment. The vet said it wouldn't work and also dogs should not be given garlic. His ears got so bad he couldn't chew his food. After 3 days on the Allimed spray he was back to enjoying his raw carrots.